Miso-Maru is made with Miso (fermented soybean paste) and dried ingredients. 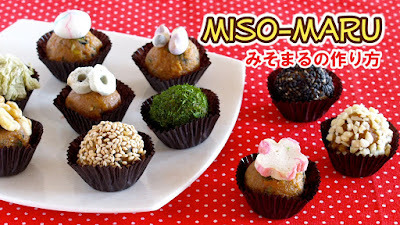 You can pre-make batches of Kawaii Miso balls. 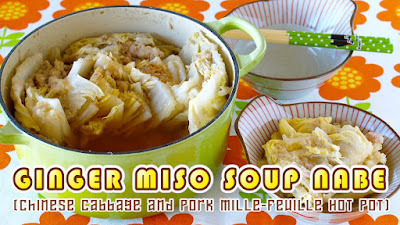 All you do is pour some hot water over it, whenever you want, to instantly enjoy a bowl of Miso soup! 1. Put all ingredients in a bowl and mix well. 2. Divide it into 10 portions and roll them into balls. 3. Finish with your favorite coatings and/or toppings. You can keep them in the fridge for a week, in the freezer for a month. Kasujiru is eaten during the cold season. 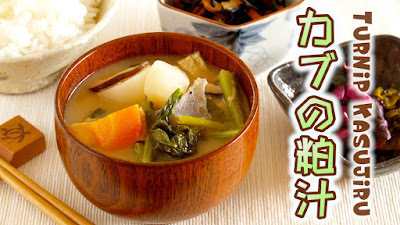 It is similar to Miso soup, cooked with Miso (soybean paste) and Sakekasu (Sake lees). 1. Tear Konnyaku into chunks with a spoon or your hands. Boil from water then drain. 2. Wash Aburaage with running water (to remove excess oil), drain well, and cut into thin strips. 3. Cut turnip bulbs into wedges. Chop turnip greens coarsely. 4. Thinly slice the carrot (cut into thin rounds, half moons, or quarter rounds depending on the size of the carrot). 5. Thinly slice Shiitake mushrooms. 6. Put Dashi stock in a large pot. 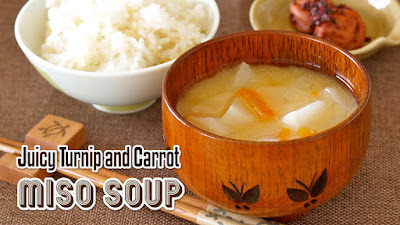 Add turnip wedges, carrot slices, Aburaage, and Konnyaku, then cook for 15 minutes. Meanwhile, dilute the Sakekasu and 4tbsp. of Miso in a little bit of broth to prevent lumping. 7. Return the diluted Sakekasu and Miso to the soup. Add Shiitake and turnip greens, then cook for 5 minutes. Taste and add more Miso to adjust the flavor. 8. Serve in a dish and sprinkle with Shichimi-togarashi (seven flavor chili pepper) if you like. 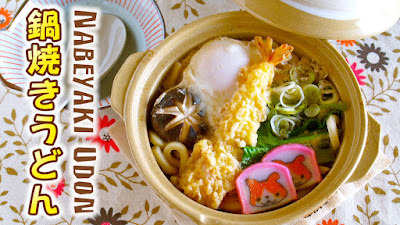 Nabeyaki Udon is a very popular noodle dish cooked in a clay pot. 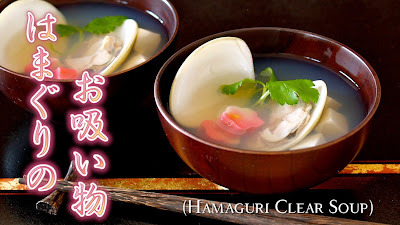 It is eaten throughout the year, especially in cold season, to warm your body. 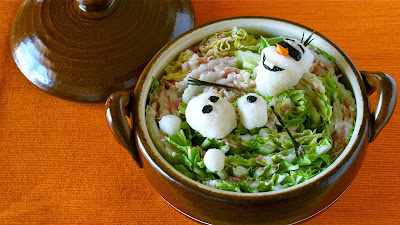 Or a perfect dish to eat when you are sick. 1. Mix the Tsuyu, put in a pot, then bring to a boil. 2. Add Udon, when it becomes to a boil again, place the toppings. 3. Cover and cook for 2-3 minutes until done. Mille-Feuille Nabe is a very popular hot pot with layers of ingredients, usually made with nappa cabbage and thinly sliced pork. 1. Separate the leaves of the Chinese cabbage, then wash and drain well. 2. Place the cabbage leaf and sliced pork alternately (make about 4 layers). Then cut in 5cm (2-inch) wide. 3. Tightly place them from the edge of the pot. 4. Dilute Miso, honey and grated ginger with a little amount of Dashi broth, then pour in the pot. 5. Cover and cook until done. It will make perfect baby food puree, too!!! 1. Cut round slices of turnip and carrot into quarters. *Peel the skin of turnip thick because the inner part is soft and perfect for baby food. 2. Put Dashi broth in a pot and bring to a boil. Add turnip and carrot, remove the foam if necessary, then cook until tender. 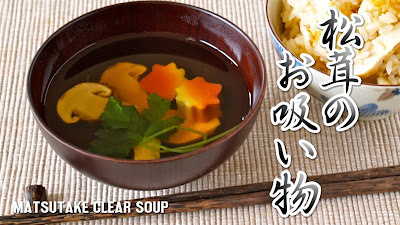 *Remove a few pieces of turnip and carrot, then mash them up in a mortar with a pestle, then mix a bit of Dashi broth to make it smooth. 3. Turn down to low then dilute Miso with a little hot broth and mix it into the soup. Heat until hot to finish. You store the mashed vegetables in the freezer for a week! Wrap a thin layer of the mashed vegetables in plastic wrap and make marks so that you can break it into small pieces when frozen. 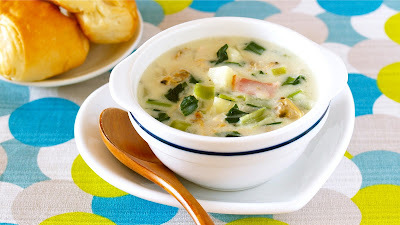 Healthy well balanced Clam Chowder using lots of vegetables, rich in vitamins, iron, and calcium. I learned this recipe at the Maternity cooking class held by the city I live in. Since I don't like milk, I used soy milk instead. *You don't have to parboil Komatsuna (Japanese spinach) because it doesn't contain that much oxalic acid content compared to the regular spinach. If you are using the regular spinach, please parboil it! 1. Chop Komatsuna and separate stalks and leaves. Dice potato and soak in water (to prevent from changing color & remove starch). 2. Heat butter in a pot and cook the chopped onion until tender. Add the chopped bacon and cook until done. Then add the Komatsuna stalks and chopped potatoes, and cook until coated with oil. 3. Add Sake, cover, and steam until the potatoes are cooked. 4. Add flour and mix until blended. 5. Add water + the liquid from the canned Asari, then bring to a boil. Add Asari and Komatsuna leaves. When it becomes to a boil, remove the foam. 6. Mix in salt, pepper, and soy milk. Cook until hot and serve in a dish. 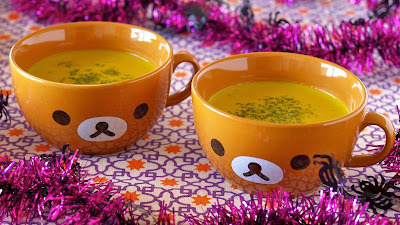 Very simple yet tasty soup! 1. If your clams have some sand in them, place the clams in a dark container and fill it with salted water (as salty as sea water). And let sit for several hours. The clams push salt water and sand out of their shells. Then drain well. 2. Put water and Yamaki Kappo Shiro Dashi (White Dashi) in a pot, then bring to a boil. Place Hamaguri, when they are open, add Umefu and Tofu, then simmer for a few seconds. 3. Serve in a dish and garnish with Mitsuba. Matsutake is also called pine mushroom. It is usually found at the foot of pine tree, very expensive mushroom because of its rarity. Price varies depending on the area of production. Recently, my mom said worm-eaten ones sold at discounted prices are really good and affordable, so I tried them out. Yes! They are truly great. They are worth to try!!! 1. Clean Kombu with moistened towel. Soak in 400ml water for 30 minutes. 2. Clean Matsutake mushroom with moistened towel if necessary, shave the hard part of the stem if necessary, then slice. 3. Lightly hit the Mitsuba stem with the back of the knife to bring out the flavor. Then tie the stem into a knot. 4. Slice Mochifu or dice Tofu. 5. Put Kombu Dashi in the pot and bring to a boil. Turn down to medium and season with B. Add Mochifu and Matsutake, then simmer for 3 minutes. Add Mitsuba, stop the heat, and serve. 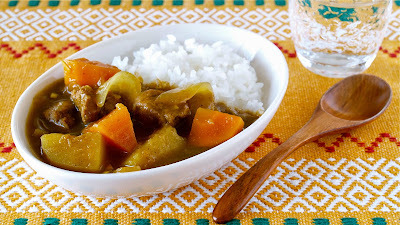 This recipe is for those who cannot get curry roux (curry sauce mix) but want to make Japanese Kare Raisu (Curry and Rice) at home. Also it is way healthier than using the roux since I didn't use any greasy fat ingredient!!! 1. Cut pork into bite-size pieces, then season with A. 2. Cut 2 (300g=10.6oz.) potato and carrot into bite-size pieces. Cut onion into wedges. 3. Place water and consomme cube (crushed) in a pot. Put on the heat, when the consomme cube has dissolved, add B and mix well. Then add the vegetables (2.) and bring to a boil. 4. Add the pork, remove the foam if necessary, add C, then cover and cook on medium for about 20 minutes. 5. Meanwhile, grate 1 (150g=5.3oz.) potato. 6. Season with salt and pepper. Then add the grated potato (5.) and cook until the soup thickens. 7. Serve the curry on a hot bed of rice. This is a very simple way to make Japanese cream stew from scratch. Using organic ingredients will make it very healthy! It may slightly separate if you use pure soy milk, so use the processed one if you want a smoother texture! 1. Remove the skin, cut the chicken into bite-size pieces, then season with salt and pepper. 2. Cut potato and carrot into bite-size pieces. Cut onion into wedges. 3. Place water, consomme cube (crushed), and bay leaf in a pot. Put on the heat, when the consomme cube has dissolved, add the vegetables (2. ), cover, and cook on medium for 10 minutes. 5. Add soy milk and cook until warm. Season with salt and pepper. Then stop the heat, mix in potato or corn starch mixed with water, then heat until the soup thickens. 6. Serve in a dish and sprinkle with parsley flakes if you like. 1. Separate the leaves of the Napa cabbage, then wash and drain well. 4. Drain grated Daikon radish very well. Then build a snowman (Olaf). Cut out Nori sheet, sliced cheese, and carrot to make his face parts, then attach them. Cut Oshaburi Kombu (chewing Kombu kelp snack) to make his hair and arms, then attach them. 5. Put Dashi broth in the pot. Then place Olaf (grated Daikon radish). Heat the pot until cooked (you can cover to cook faster). 6. Dip in Ponzu Sauce to eat. Fresh Wakame seaweed is in season in spring in Japan! My mom bought it as a souvenir. 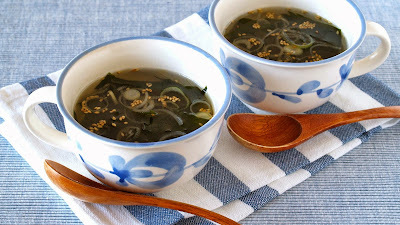 Wakame soup is highly nutritious soup that contains a high content of calcium and iodine. You can blanch the fresh Wakame in boiling water (which will turn the natural brown color to the green we are familiar with) and freeze up to a year. When you use, you can just defrost at room temperature or soak in water. 1. Blanch the fresh Wakame leaves in boiling water (which will turn the natural brown color to the green). 3. Add Wakame and cook until hot. 4. Place B in serving bowls. 5. Ladle the soup into the bowls. 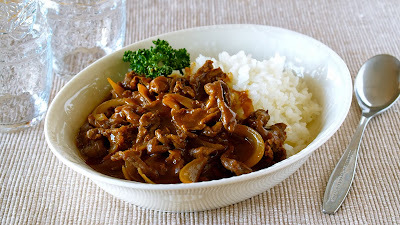 Hayashi Rice (also called Hashed Beef) is a very popular Western-style rice dish in Japan. 1. Thinly slice the onion and carrot. Make cross incisions on the bottom surface of tomato. Bring a pot of water to a boil, pour it over the tomato to soften the skin, then peel (you can also dip the tomato in hot water for a few seconds to soften the skin). Seed tomato and cut into small pieces. 2. Heat butter in a large stew pot. Add the sliced onion and carrot, then stir-fry on low until lightly colored golden brown. 3. Add red wine and simmer on low until somewhat absorbed. Add flour and mix well. 4. Add tomato, demi-glace sauce, consomme cube, bay leaf, and water. Bring to a boil, remove the foam, turn the heat down to medium, season with salt and pepper. Then cover and cook for about 5 minutes. 1. Cut thinly sliced beef into bite size pieces and season with 1 tsp. of salt. Slice onion into bite-size wedges. 2. In a large stew pot, heat 1 tbsp. of cooking oil, stir-fry the onion slices until tender. 3. Add 1 tbsp. of cooking oil and the beef, then saute until no longer pink. 4. Add the roux, then cook on low for 10 minutes. Season with salt and pepper if needed. 5. Serve it on a hot bed of rice. Garnish with parsley if you have. 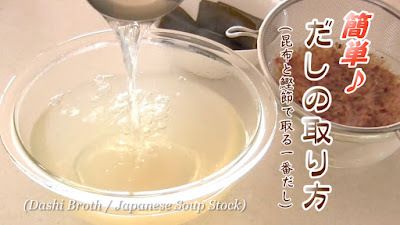 Vege Broth is much-talked-about these days in Japan on TV and in magazine articles. What you do is you make the broth using vegetable waste. 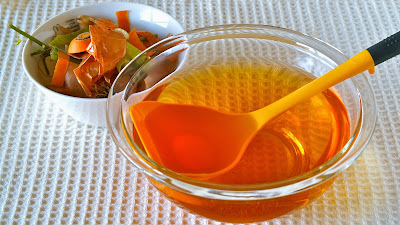 The broth is rich in phytochemical which builds your immune system. You can expect health benefits (prevents cold) and beauty effects (anti-aging effects). Very economical and healthy broth! It doesn't have a taste but fragrant. You can also use it to make ramen or instant foods! Enjoy the wholesome goodness of vegetable waste!!! Some vegetables are not recommended since they smell bad when simmered. You can collect the vegetable waste in the fridge. 1. Wash the vegetable waste very well. 2. In a pot, put water, vegetable waste, and Sake. Put on low heat and simmer for 30 minutes. 3. Stop the heat and strain the liquid through a sieve into a large bowl and discard the vegetable waste. ※You can keep it in the fridge for 3 days. OR freeze it in an ice cube tray for a week. You can make the soup by adding it in 800ml of hot water. BUT if you make in the way I did, it becomes really delicious!!! 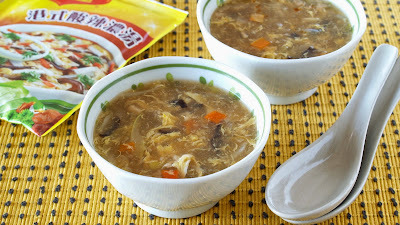 This soup mix is not sold in Japan and I thought it is easy and fast way to enjoy authentic flavor of hot and sour soup. 1. Cut the long onion into thin strips. Thinly slice the chicken and season with A. 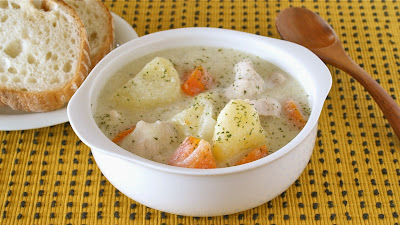 *by adding starch, you can seal in the juices and the flavor (Umami) of the chicken when you cook. 2. Bring 800ml water to a boil. Add chicken, then remove the foam if necessary. 3. When the chicken strips are cooked, turn off the heat, and mix in the soup mix. 4. Then simmer again, add the long onion strips, slowly stream the beaten egg through chopsticks so that the egg cooks in ribbons. 5. Season with black vinegar if you like. 6. Serve in a dish with Ra-Yu (it wakens up your appetite) if you like.